[HOW TO] Break the Ice Among New Family Members and Bust a Move. 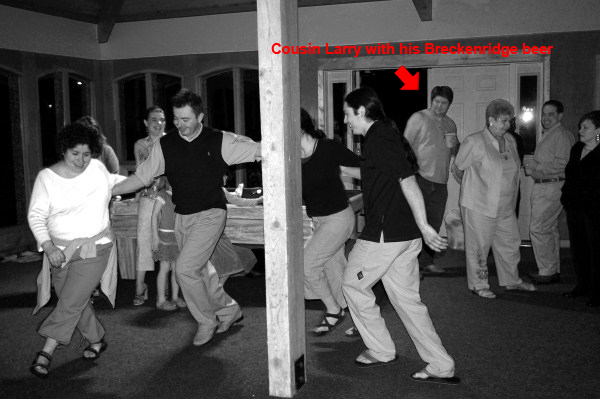 We decided to brush up on our moves the night before the wedding at our rehearsal dinner at the neighborhood clubhouse. We shared a local Breckenridge beer for all to enjoy and played traditional Greek and Mexican music while learning a few dances from each other's cultures that we would be performing the next evening at the wedding in Breckenridge. Rehearsal dinners can be as formal or informal as you want. And not everyone you invited to the wedding needs to be invited to the rehearsal gathering. We opted for an informal barbeque, and my sister surprised me with a chocolate cake that looked like a mountain, complete with streams and a fish jumping out. I love chocolate cake. My Aunt Diane in the picture above is the queen of the dance floor. The night after this pic was taken was our wedding, she and my Uncle led everyone through a twisting maze of people in what's become a tradition in our family at the dances. This photo shows the view as you descend to town in the gondola that travels between the parking lots and the base of Peak 8 at the Breckenridge Ski Resort. It show how you can focus in on certain parts of your family, like dance and music, to help bring your experience together. Think about how you best show the greatest qualities on both sides, while having fun. Good luck, and we'd love to hear some stories of what you did!